The persistent speculation on a possible nuclear power investment in South Africa being progressed on an urgent basis is concerning, given the scale and inflexibility of such an irreversible commitment in a fast changing world. 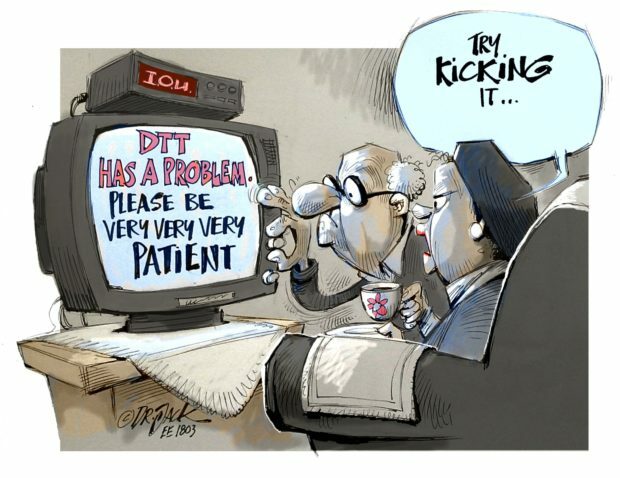 Reassurances that we will only embark on such a programme at a scale and pace which the economy can afford somehow doesn’t quite settle the nerves, and the sceptics can perhaps be forgiven after the latest cabinet reshuffling and the renewed political uncertainty it triggered. The other school of thought says that the electricity supply industry has changed fundamentally and in a country such as South Africa, with ample renewable resources, the lowest cost (and cleanest) supply mix going forward is renewables and flexible generation technologies, complemented by demand response solutions and energy storage. It may also require some flywheels or synchronous condensers at a later stage to maintain system stability when deep penetration of renewables is targeted. Grid management will be more complex, but we can do complex! When is the next investment decision required? It may be helpful to remove the emotion from the debate, adopt a technology agnostic stance and first and foremost consider the question of when the next major base load investment may be required. The Draft IRP2016 Base Case published by the DoE for public comment calculated that 2037 may be the date when new nuclear will be required (given their assumptions), but closer scrutiny will show that the Draft IRP used a very optimistic demand growth assumption, and more a realistic growth outlook will obviously move such a date further out. 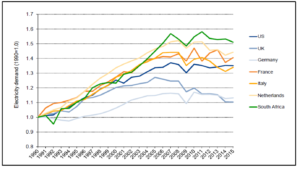 To get a better understanding of the structural drivers underpinning the national demand growth outlook the Energy Intensive Users Group (EIUG) commissioned a study and found that the levelling off of demand growth after the sub-prime crisis of 2008 is by no means a South African phenomenon. In fact, as is evident in Fig. 1, it points to a structural behavioral change in the world driven by higher retail prices and an increased focus on energy efficiency to combat climate change. When economic growth returned to many countries after the 2008 economic meltdown, it was not accompanied by renewed demand growth as before. Demand growth did not stop due to us running out of supply. It is a coincidence that this global structural tipping point happened at the time South Africa had a power crisis in 2007 (with the Koeberg incident) and early 2008 (when Eskom ran out of coal). The load shedding and load curtailment during 2014 and 2015 obviously caused severe economic damage, but its effect on the national demand was rather limited. This is evident from the fact that the end of load shedding did not result in an increase in demand. On the other hand, the effect of soft commodity markets and significant electricity price increases since 2008 had a profound effect on energy intensive industries. The contraction in industrial energy demand (-6% in 2015) explains why our national demand remained flat to negative, even after supply shortages came to an end. Therefore, in South Africa, where 40% of electricity demand is in the industrial sector, the electricity demand growth outlook has more to do with China’s future demand for commodities than local electrification and building the odd new shopping mall here and there. At risk of stating the obvious, we need sustained and stable GDP growth driven by foreign direct investment, and the outlook for this is pretty bleak at present. While commodity prices are showing signs of improvement, it is clear that we are not going to see another super boom situation as we experienced before 2007, due to structural changes such as China’s over-building of smelters and steel mills. 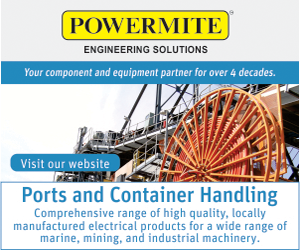 Another indication of how the world is changing is that some smaller smelters in South Africa are being displaced by overseas competitors or affiliates with access to cheap surplus power during periods when excessive wind generation is available. Add to that the likelihood that deeper penetration of rooftop PV will not only displace some Eskom generation during the day, but also change the load profile and require more flexible generation for balancing purposes. The future will be different from the past. Forecasting the future is always risky, and for reasons of prudency one would rather err on the side of caution and rather build too much generation than too little. 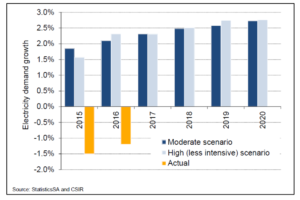 However, it appears that the demand forecast used by the DoE in the draft IRP2016 is an extrapolation of the past and fails to factor in the structural changes evident in the electricity supply industry as mentioned above. The historic data used to develop the regression relationships spans too great a time period, resulting in regression points 15 to 20 years old carrying the same weight as more recent data (although it does make some provision for the reduction in energy intensity of the economy). It’s macro-economic growth assumptions are too optimistic (Fig. 2), as are the mining index assumptions. As a result the actual demand growth experienced during 2015 and 2016 lags the forecast significantly (Fig. 3), to the extent that we are already some 6,7% below the forecast after only 2 years. (6% roughly equals one 6-pack power station). Fig. 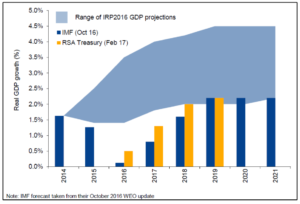 2: Comparison of IRP2016 GDP projection and IMF projection. Fig. 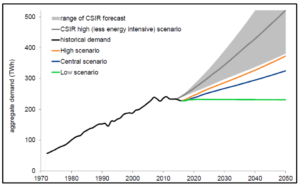 3: Actual electricity demand growth compared to scenario forecasts. The EIUG contracted a firm with unique IP in energy forecasting (Pöyry Management Consulting) for a review of the demand forecast used in the draft IRP2016, and to develop an alternative demand outlook. While this was a high level study and out of scope for this article, the results confirms the view of the EIUG that the world has changed and that building expensive long-lead time base load generation stations now will come with a significant risk of over-capacity, stranding existing stations before the end of its economic life with all the socio-economic implications of a disruptive transition to a low carbon economy. We cannot afford that. Fig. 4: Demand projections for South Africa (Source: Pöyry power demand model). An analysis of the Draft IRP modeling indicates that the model will only select nuclear as an option over the short to medium term if we have strong demand growth, and limit the annual amount of renewables allowed to be build and impose more onerous carbon limitations than the agreed Peak-Plateau-Decline trajectory on the system. Relaxing any of the three conditions will cause the IRP model to select a more economical alternative. The demand growth assumption used in the Draft IRP is too optimistic and the DoE is requested to revisit the assumption and correct the starting point to the actual system demand before doing further IRP model runs. The recent downgrades of our foreign debt to junk status and the higher risk premiums foreign investors will require should further inform the view that it is irrational to plan for a future comparable to the energy boom years of the past. The annual caps on the rate of renewable roll outs in the IRP stems from the previous IRP2010 when there were still uncertainties on the practicality of building more than 1000 MW of solar PV and 1600 MW of wind annually. Experience since then has shown that these limitations can be relaxed and will not come into play in a lower demand growth outlook. A more realistic demand growth outlook also implies lower emissions. We are currently tracking well below the trajectory foreseen when the PPD targets was accepted. It is therefore hard to see how nuclear can seriously be considered on an urgent basis under the current circumstances, even if the funding can somehow be arranged. Forcing a very expensive and unneeded nuclear investment into the mix without the demonstrated demand growth required to take up the new capacity comes with huge risks of stranding existing plant and triggering a “death spiral” scenario where above inflation price increases and demand destruction start to feed on each other. Such a scenario will lead to large power users either relocating or becoming more self-sufficient, which will trigger the next cycle and put further pressure on small residential users who are currently being subsidised by large users. It is hoped that the Minister of Energy will end the current uncertainties by coming out with a clear statement that the need and timing of a possible nuclear investment will be informed by the updated IRP, once the study has been completed and public consultation has been considered.